A big thank you to all those who volunteered to help on poolside, especially to Kath who took on the role of Team Manager for all but one of the sessions. 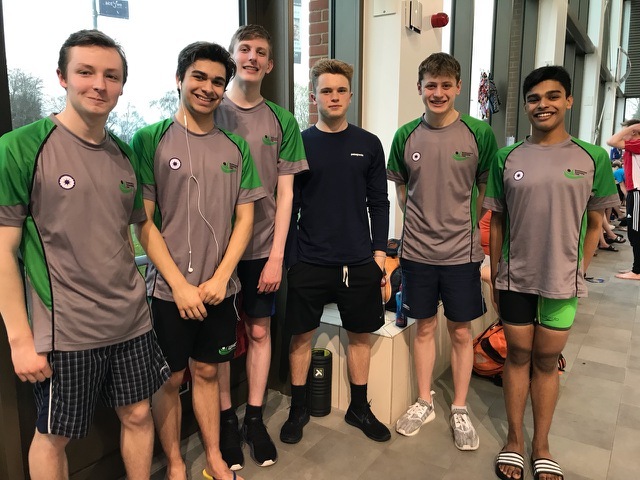 Nine Berkhamsted SC athletes travelled to Luton’s Inspire pool for the 50m pool experience in the Level 1 meet and came away with some excellent results. Probably pride of place among the list of personal bests and club records should go to James Chennells as he became the first swimmer from the club to duck inside 2 minutes for 200m freestyle long course just weeks after being the first to achieve the same feat in a 25m pool. His time of 1:59.52 moves him into contention for a place at the National Championships in July and placed him 2nd in his heat and 6th overall, improving his pb by nearly 2 seconds. The meet had begun with James Chennells, Zac Patel & Ish Rahim contending the 100m fly. In the intra-club competition James Chennells came out on top posting 1:01.65, improving his best by half a second for 12th overall. Zac Patel nudged inside his own best by just 0.03 seconds clocking 1:02.50 (18th) with Ish Rahim hitting the pads just 0.04 shy of his pb in 1:03.41 for 20th. Alex Kalverboer was swimming in a 50m pool for the first time and did not disappoint. His 43.22 for the 50 Breast placed him 12th and converts to a short course pb as well. He followed this up with 1:20.92 for 11th in the 100m Back which would also convert to a short course best; 2:43.41 for the 200m Free and 3:06.25 for the 200m IM placing 12th in both. In the 50m Breast Jack Filer returned from University in Durham to swim for the club and improved to 31.79 to place 13th in a club record time followed by an occasional appearance in a club hat from Louis Armitage whose 32.60 was also a club 15 year old age group best time. Also competing in the 50 Breast was Euan Donald who touched in his own pb of 36.84. Alongside James Chennells and Alex Kalverboer in the 200m Free, Euan Donald lowered his best time by a massive 6.82 seconds finishing 3rd in his heat, 18th overall, with 2:12.82 and Dan Chennells who finished with 2:16.31 for 21st and another converted pb short course. James Chennells, Ish Rahim, & Zac Patel also competed in the 200m IM all finishing slightly off their best before Alex Kalverboer finished his busy day with another 12th place in the 200m Breast, 3:35.94. The day finished with the 50m fly and Euan Donald set the tone with 2nd place in his heat. Targeting a sub 30 second swim he finished just short with 30.16 still an improvement of nearly 2.5 seconds. Sam Newman went sub 30 for the first time just 2 weeks ago at Basildon but followed it up by dropping a further 0.44 seconds to post 29.07. Then James Chennells set another pb with 27.79 for 3rd in his heat (14th overall) before Jack Filer and Ish Rahim went head to head in the same heat. Ish Rahim just came out on top posting 27.44 for 3rd in the heat to Jack Filer’s 28.45. Final swimmer on the day was Zac Patel whose finish looked to place 2nd but was given as 4th in a time of 27.02. Day 2 was much less busy but the swimmers showed fatigue from a busy first day. In the 50m back both James Chennells and Rahim began the race well but were disappointed with their finishes, recording 30.98 and 31.13 respectively. In the 100m Breast Jack Filer, to use his words, ‘died horribly’, in the last 30m after a fast start but was still only 1/3 second slower than his best with 1:14.07. James Chennells led his heat 100m free at half way, splitting 26.49 at 50m before being caught on the line, to finish 2nd in the heat and 8th overall, exactly replicating his time from Basildon 2 weeks earlier of 55.12. Euan Donald was the only club swimmer to brave the 200m fly and his lack of recent training showed through when after a good first 150m he faded to post 2:31.87, still nearly a 9 second improvement from his previous best. The meet finished for the boys with the 50m free and Louis Armitage shone through again with 15 years 2nd overall in 26.04. Dan Chennells clocked 27.83 which would convert to a 27.00 short course time, well inside his current best and then James posted 25.64 in the final heat to claim 8th overall after a long weekend.